Bring scalability, flexibility, security, and performance to your Oracle workloads, while reducing the cost of infrastructure and Oracle licensing when you deploy on Azure. Some database workloads like SQL Server or Oracle require high memory, storage, and I/O bandwidth, but not a high core count. Many database workloads are not CPU-intensive. Azure offers certain VM sizes where you can constrain the VM vCPU count to reduce the cost of software licensing, while maintaining the same memory, storage, and I/O bandwidth. Provide the availability, security, and performance your enterprise workloads require at a fraction of the cost of running on-premises. Azure constrained-core virtual machines are optimized for Oracle workloads to help you lower your Oracle licensing costs. 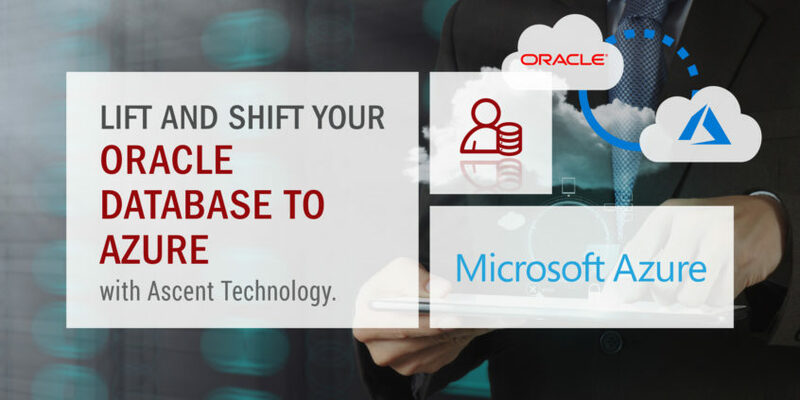 Use your existing licenses to run Oracle software on Azure and receive best-in-class, end-to-end support from Microsoft and Oracle. Rely on the cloud platform built for enterprises to ensure that your Oracle workloads achieve the scalability, flexibility, and compliance your business requires. Upgrade to a modern infrastructure with virtual machines and high-performance, SSD-based premium storage. By providing flexibility in the size and performance of storage and compute resources, Azure helps you ensure that your Oracle applications will scale to meet business demands. How do I engage with Ascent? We encourage you to Contact Us, and we will assist you to Lift and Shift your Oracle Database to Azure.